PERTH, Australia - A U.S. Navy P-8A Poseidon patrol aircraft completed its transition from Kuala Lumpur to Perth March 18 to continue the search for Malaysia Airlines flight MH370 in the southern Indian Ocean. "The search has expanded to the southern portions of the Indian Ocean and the P-8A has the range required to reach those waters,” said Lt. Clayton Hunt of Patrol Squadron (VP) 16, the search and rescue detachment mission commander. “We will be most effective operating out of Perth." For a mission such as the MH370 search, the P-8 will typically fly at 5,000 feet, dipping to 1,000ft to get a closer visual look at objects. They typically fly at a speed of 250-270 knots, with a search time of eight to nine hours depending on the distance to search area. "Even though we are flying long missions, the purpose behind these missions gives the crew the motivation to overcome any obstacles that may come up," said Naval Aircrewman Operator 1st Class Robert Pillars, an acoustic systems operator on the P-8A. During its missions out of Kuala Lumpur, the P-8A crew identified more than 400 radar contacts. Unfortunately none were associated with aircraft debris or wreckage. The aircraft's advanced radar capabilities allow the crew to recognize and investigate small contacts on the water's surface. The crew uses the onboard camera system, as well as a multitude of sensors, to investigate the contacts. 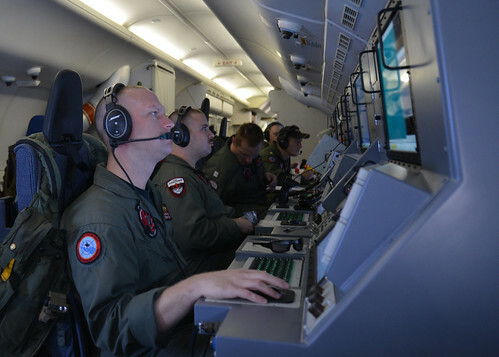 "While on station, the crew uses all of the aircraft's sensors to identify objects in the water since we don't know exactly how big the debris may be," said Lt. Joshua Mize, a P-8A Poseidon tactical coordinator. There are many factors that come into play that could improve or decrease the efficiency of the search. "While the process may seem simple, factors such as the number of ships or objects in the area, sea state, drift rate, and visibility can affect how much area we're able to cover," Mize added. The search grid used varies from flight to flight. Not only does the crew have to account for various environmental factors, the distance to the search area is also taken into account. "Depending on the transit distance, some flights may only have 2-3 hours of search time," Mize said. "Our goal is to cover as much area as possible while still being thorough with our search. Being thorough is critical, especially in a search like this." In terms of mission effectiveness and reliability, the P-8A represents a leap forward for the Navy's maritime patrol and reconnaissance. The aircraft has a maximum speed of 490 knots, a ceiling of 41,000 feet, and provides a range of more than 1,200 nautical miles with four hours on station. "Having the flexibility and readiness that comes with the practicality of the P-8A airframe (Boeing 737), as well as our well-trained aircrews and maintenance team, we have been able to continuously meet and exceed our mission requirements," said Senior Chief Aviation Structural Mechanic Carlos Ure, the search and rescue detachment senior enlisted leader. "Our maintenance and aircrew teams continue to work together to have the Poseidon ready and safe for flight." Being able to work off of a commercial airframe, such as the 737, the Poseidon maintenance personnel have the ability to use both military and civilian assets to perform necessary maintenance. "So far, we have been able to accomplish all of the pre-flight, daily, and turnaround requirements using whatever resources we have available, be it military or civilian resources," Ure said. VP-16 is currently conducting the first operational deployment with the P-8A Poseidon in the U.S. 7th Fleet area of responsibility supporting security and stability in the Indo-Asian Pacific. The new P-8A is part of the Navy's commitment to the Pacific rebalance, bringing newer and more capable aircraft to 7th Fleet to ensure the Navy is best postured to honor its security commitments to the Indo-Asia-Pacific and contribute to regional security and stability.